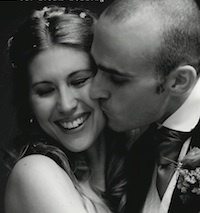 Philippa, English, from Surrey, and David, half Italian and half English, were married this summer on Lake Como. 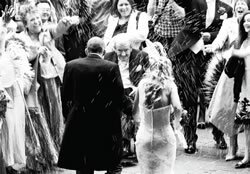 Soon after the engagement, they agreed they’d get married Italy, partly because David’s father would be unable to travel to the UK, but most importantly, because David grew up near Lake Como which was the perfect setting for a wedding. Philippa and David both agreed they didn’t want a religious, church wedding so they immediately knew it was going to be a civil ceremony. Originally they had set their hearts on doing everything in one venue (i.e. ceremony and reception), but this wasn’t possible for the date they wanted. However, after some research, they came up with a good alternative. Now all they had to do was finalise the details. But even the most organised souls have pre-wedding nerves. Philippa remembers: ‘I think my big panic moment was about two months before the day, when there still seemed like a lot to do, but after our trip to Italy three weeks before the wedding, I managed to calm down. Though even then there were some iffy moments. "The days running up to the wedding were part of what I enjoyed most.."
Philippa and David wanted to visit the town hall in Como where they were going to be married. ‘It was a gorgeous, rich red room,’ says Philippa, ‘but it was set up like a huge meeting room. When we asked if they’d be reorganising the hall before our wedding, they said no, and that the room would stay as it was. I had sudden visions of my wedding photographs with people crouching behind microphones and with a fax machine in the background. I was trying to hold it together but could almost feel my bottom lip start to tremble. David saw the look on my face and said, ‘Just leave it to me.’ He went off to talk to the gentleman from the comune who listened carefully to him. He disappeared, then returned a few minutes later with a key, and let us view another room full of light and beautiful chandeliers and frescoes. And when he saw how much we liked it, his face lit up and he said, ‘Just leave it to me’. The gentleman’s name was Signor Paladino and he must have taken a shine to us, as he was as good as his word. ‘I had decided early on that I didn’t want a strapless dress,’ says Philippa, ‘but at Berketex Brides, the assistant said she’d like to suggest a few dresses to me that she thought would suit me. One that she picked out was the Angelique model, but as it was strapless, I didn’t think it was going to be right. It was the first dress I tried and as soon as I put it on, I felt absolutely amazing in it! It had a Hollywood glamour feel to it that suited my personality and style and both my mum and I just loved it. As it was too early to make a decision, I decided to look around, but 18 months and plenty of dress shopping later, I went back and bought the very first dress I had ever tried on. And it was so amazing to wear it on the day. It really was The One! Philippa decided on a theme of deep red roses for her wedding, so she used the red detail for the bouquet, the flower-girl dresses, her hair accessories, the flower decorations at the Town Hall and the reception. She also had silk red rose petals scattered at the Town Hall and around the wedding cake. Philippa and David’s reception was held in the gardens of Villa Olmo on the shore of Lake Como, a place they’d had their eye on for some time. ‘To be honest,’ says Philippa, ‘David and I had visited the villa various times and had really set our heart on getting married there, but it was booked solidly and it was impossible to find a date that suited us. We had really wanted to get married and have the reception all in one place, but even with the help of our wedding planner we couldn’t swing it.. However, in the end we hired a coach to pick people up from their hotels and drop them off at the town hall and the villa, and basically it shuttled people to and fro all day long. It worked really well. One of the couple’s concerns was what to do with their guests between the morning ceremony and lunch and the evening entertainment. But they needn’t have worried. ‘Apart from the fact everyone was very relaxed and easy-going,’ says Philippa, ‘we had forgotten that an Italian lunch would eat up a good four and a half hours… One of our friends had a baby with her and had to feed him twice during the meal! But the fact that the setting was so laid back and easy meant that between courses, guests felt free to float between tables (we had named all the tables after Italy’s World Cup players: Cannavaro, Toni, Buffon…), or even take the children down to the Lake for a break. The restaurant, Ristorante Villa Olmo, was in the Villa grounds, and their food was astounding: the English contingent simply couldn’t believe how good it was or how much there was of it! And the staff bent over backwards to make us happy.